Okay, so we all know I love cake and kids books. So what we have here is a children’s book about cake. 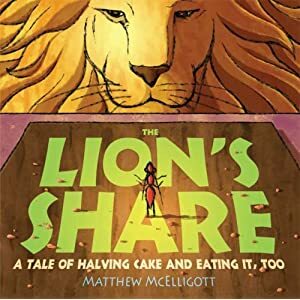 It is a fairly new book 2009, by author and illustrator Matthew McElligott, Lion’s Share: A tale of halving cake and eating it, too. In this unusual “cake” tale – a lion has invited the ant and various others to join his special dinner. This seems such a nice gesture until ant realizes what pigs the other guests make of themselves – right down to the cake. See the cake is first presented to elephant who gladly takes half of the cake and passes it down well hippo take half of that and this cake halving continues until ant hasn’t anything but crumbs and nothing left for lion and herself. She offers to bake another cake for lion tomorrow. Well each guest decides they are going to top that; beetle claims he will make two cakes, frog four and the doubling coninues…until elephant has to make “two-hundred and fifty six” cakes. Well as you might guess as everyone is slaving away the next day – lion and ant are enjoying a strawberry sponge cake. What I like about this book is its funny twists, its learning experience and it is about cake. This would be a great tool to use for fractions, counting and multiplication. This is a great math learning book, similar to Greg Tang’s math riddle books. For this special “rocking” birthday…I had a special request. A simple request really. The order was pink – then birds – then cup cakes. I was like really that’s it? I mean I work with ice cream cake and make hundreds of cakes a week. That was it, just cupcakes, with pink icing and birds. I thought well ok I could go for some cupcakes about now. ....or a product of that vision. And well….really after all that white cake, mixing and cupcake filling and baking…the rest fell into place. This was a special birthday. And a tribute to the twitter bird? Maybe or just birds in general. She likes pink, birds and vanilla cupcakes. And voila’ ….we have…a birthday…..
No , not 30 Rock – 30 Rocks! Turning 30, rocks! I guess I should know I turned 30 a bit ago and I just remembered that I don’t think I ever posted my birthday cakes that I actually ordered from work. Now with gourmet cakes like that who wouldn’t agree that 30 Rocks! So, Happy Birthday, Amy! Enjoy your cupcakes, your pudding cake and may 30 Rock your world and 31 and 32 and 33……. May the sun shine bright. Like a bird in flight! This year and many – Happy Birthday!! Just a little teaser to keep you thinking about what we have baked up – how and why? Yes we’ve baked up a special treat for a special birthday- Not Saint Patrick’s birthday but a near and dear birthday here at Sweets and S’morsels (family). Here are a few more views to keep you “seeing green” – we will return Thurday with a full post on this lucky charm. Happy Saint Patrick’s Day! The cake is three “mini” 6 inch heart shaped pans by Wilton – chocolate cake with a Wilton Whipped Buttercream Icing. Using a large round cake board I set the three hearts end to end with some extra cake for the stem and voila’ a shamrock appreared. Completed with green trim border and shamrock confetti this cake made Pat smile and he really appreciated the work and effort. But I was glad to do it. I love to play with cake and bake it is fun, exhausting and fulfilling all in one. I am the cake hobbiest in the home so it is now my call of duty to bake for each birthday that comes along. Sweet’s and S’morsels is busy baking, caking and decorating – getting ready for a trio of birthday’s at the end of this month. So rest assured that the cakes will commence very soon! Check back for birthday cake posts on March 17th, March 23rd and March 29th. Don’t forget Easter is just around the corner and we will have a special cake to feature as well. Until then here’s to your sweet tooth :-). Okay, I am just going to be brave here. This cake that you see to the right was such a challenge and the end result – well if you follow the directions and take your time you will have a good one! However, a few weeks back, no, a few months back my niece came to me with a request or a thought! And I said ok. Her request for a special birthday cake was my task. Well life certainly handed me a big heaping task here. Something I had never before attempted – the three tiered all fondant cake. I mean I am not the Cake Boss – I wonder if he is hiring though. Anyway, I agreed to this project and her design was so creative and unique. (I still am wondering what it is about all thes tween and teen cakes in green. ) And having taken the latest Wilton Fondant and Gum Paste class well I took on this challenge. When I say I deviated from the “rules” I really did. (1) A cake that should have been 6″ 10″ 14″ or 8″ 12″ 16″ turned out to be 6″ 8″ 10″ just not enough room to mauver an off set stacked cake. (2) I still am wondering what was up with my marshmallow fondant – that is tricky stuff. Some notes – the cake was covered in whipped butter cream icing and covered in green tinted, homemade marshmallow fondant. So I am wondering was it too soft – hard- airy – bubbly? Should I try fondarific next time or someother fondant? I promise I will do it and follow the directions next time and it is about time. I am going into my 2nd year of caking for a hobby/side business and I want to do it with all my efforts and do it well. One little funny that I have to share – during the birthday candle sing along the fondant got a little toasted. YES Folks since it is marshmallow fondant it is flamable! So be careful with those birthday cakes. Oh and it was yummy too!